Ferraris are widely regarded as the world’s finest sports cars, and we’re not about to argue. However, it’s often incorrectly assumed that a standard Ferrari can’t be improved. The truth is, even Ferrari is forced to compromise in the production of its cars; to appeal to the broadest spectrum of customer tastes, meet emissions and fuel requirements, and for homologation purposes. Careful selection of aftermarket modifications can enable your Ferrari to perform, handle, sound and look genuinely better. Here we take you through the top 5 modifications that every Ferrari owner should know about. Reclaim what Ferrari is forced to leave on the table! 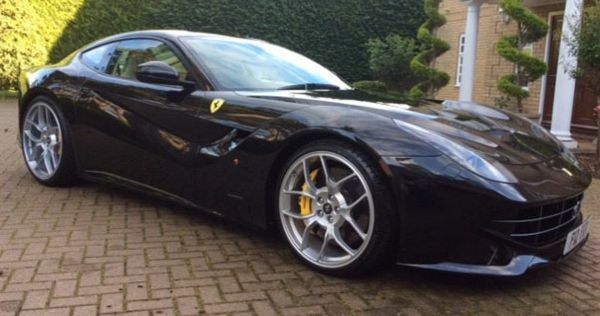 Don’t be under the illusion that your standard modern Ferrari sounds exciting. It really doesn’t. To obey new-car noise emissions regulations, the manufacturer is forced to install valved exhausts, which are silent and then become louder in a sudden obnoxious transition. When these systems do open, owners get a flat restricted blare, which is nothing like the wonderful visceral exhaust note that could be enjoyed from such an engine. The turbocharged Ferrari 488 is the best example. By fitting the Novitec exhaust kit, the engine sound and volume is utterly changed from a subdued rumble, to a high-pitched F1 motorsport-style scream, which is fully switchable with a remote control. The system is made in aerospace-grade stainless steel, warranted for life, and will give you a plug-in power increase. 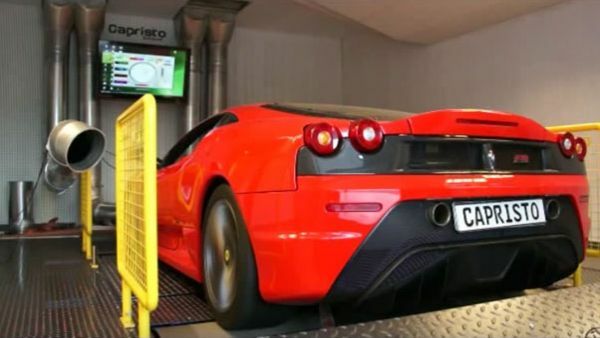 The video below demonstrates the Ferrari 488 GTB howl with Novitec’s exhaust system! Even the much-lauded stock exhaust notes of the modern V12 engines see some dramatic improvements, with sport exhaust fitments producing unbelievable old F1-car-style sounds. 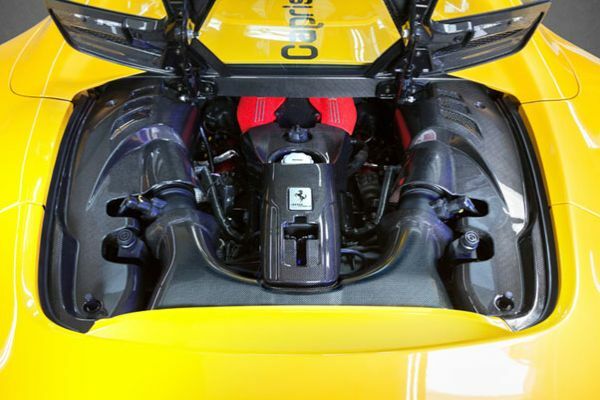 All of Scuderia’s sports exhausts are plug and play, reversible, and require no invasive work to install. They really are BOLT ON. There’s no reason why your Ferrari should ever have exposed plastic parts or be left looking “unfinished”, so why not reinforce and enhance your car’s weakest points? 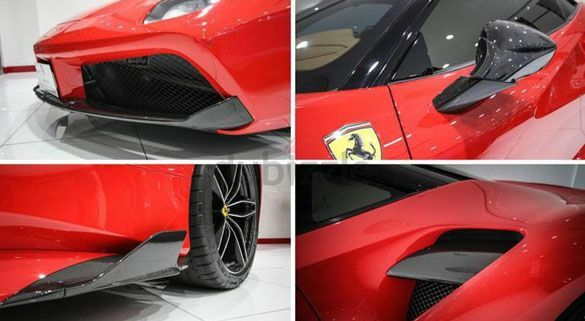 Beautiful carbon fibre upgrades replace the cheap-looking plastic parts and can complete or enhance your Ferrari’s exterior, whilst improving aerodynamics. For owners wanting a more unique look, carbon upgrades can be used to truly customise the car to your taste. Take a look at the pics below and get ready to salivate! Once again, all these panels require no invasive work to install. They’re reversible, but when would you ever take these beautiful upgrades off? As Ferrari delivers to more emerging markets, with less smooth road surfaces, it’s being forced to deliver cars with ride heights and suspension geometries which aren’t especially sporty. Fitment of sport springs remedies this by giving your car the low-slung look that Ferrari originally intended during the development of the car. Running your Ferrari at the originally intended height, gives further handling benefits, such as improved high-speed stability, enhanced body control, and sharper dynamic responses. Sport springs and other suspension hardware can be combined with revised suspension geometry settings, to yield sharper handling for enthusiastic drivers and owners who track their cars and want to exploit their underlying potential. These variable rate sport springs work with your original dampers and leave ride comfort, and “manettino” operation unchanged. For owners who also choose to customise their suspension geometry, once again these are all small, reversible, adjustments rather than outright modifications. 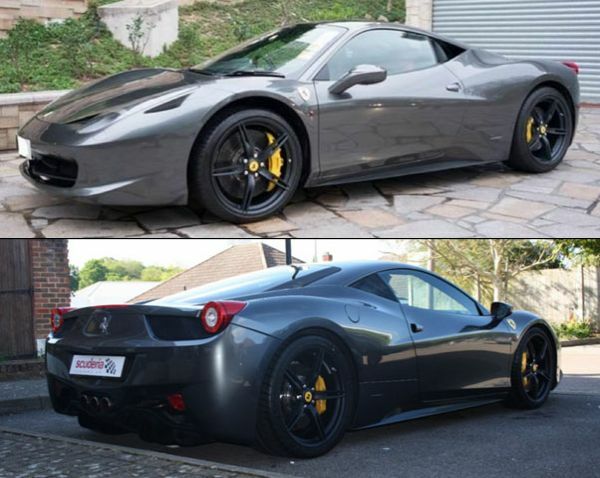 The following photo shows a before and after of a Ferrari 458 suspension lowering and geometry setup, (in conjunction with the next upgrade genuine Ferrari 458 Speciale wheels). Why would you want to change the beautiful standard wheels on your Ferrari? To enhance the look of the car and its handling characteristics, that’s why! One of the smartest upgrades for your Ferrari 458 is to install the wheelset from the 458 Speciale or install the F12 TDF wheels on your Ferrari F12 and similarly, the 599 GTO wheels on you base Ferrari 599 GTB. The wheels from limited edition cars tend to give the base car a much more aggressive look, which works beautifully. You should also consider wholly aftermarket wheels from reputable manufacturers depending on your needs. The picture below shows special order ultra-light forged BBS wheels on this owner’s track-day Ferrari 430 Scuderia, which have a clever offset that widens the track, whilst using the stock tyres! They’re even lighter than Ferrari’s own optional five-spoke 16M performance wheel, reducing unsprung masses, and improving damper and steering response – and they look fantastic! Sometimes combined with larger, more aggressive rubber, they can also deliver more grip, high-speed stability, traction and braking capability. These wheel changes are a quick-fix no-brainer. Carefully selected, as above, they may not even require new tyres and can be bolted onto your car in a matter of minutes without any further work. The wider Novitec wheels on this Ferrari F12 fully fill out the arches, which benefits traction and look beautiful. People primarily buy Ferraris for their performance, but the manufacturer is forced to de-tune its cars’ engines from their ultimate potential, to comply with emissions and fuel economy targets. With straightforward, non-invasive modifications, substantial power gains can be released for enthusiasts and track day drivers. Combining power kits with sport exhaust upgrades augments the power increases further. A simple plug-in power kit can be installed on your Ferrari California T, releasing a massive 86bhp extra through a combination of eliminating fuel economy and emissions considerations, and solely optimising the engine for power generation alone. 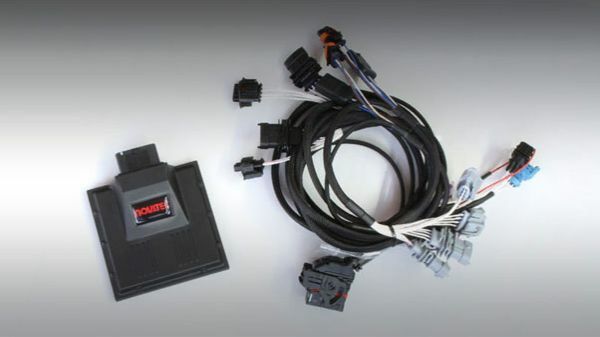 These power kits (and corresponding intake and exhaust upgrades) are fully reversible – as said before – they plug in, and DO NOT compromise the long-term reliability of the car. They simply release the car’s true performance. Scuderia Car Parts is one of the most experienced and well-respected companies in the world for helping owners get the very best from their Ferraris and exotic cars. We have thousands of customers in over 90 different countries, ranging from Ferrari enthusiasts to collectors, from service centres to authorised main dealers. Our expert team prides itself on our unique knowledge, which other companies simply don’t have. We know which products work on what cars, to deliver specific results and ensure owners are thrilled when they drive away from us – and come back to us for more upgrades when they inevitably move to their next Ferrari!